This week (March 23, 2018) on the WP-Tonic show, our guest had to reschedule. Host Jonathan Denwood and I used the session to discuss Membership Websites and how to evaluate WordPress membership plugins. 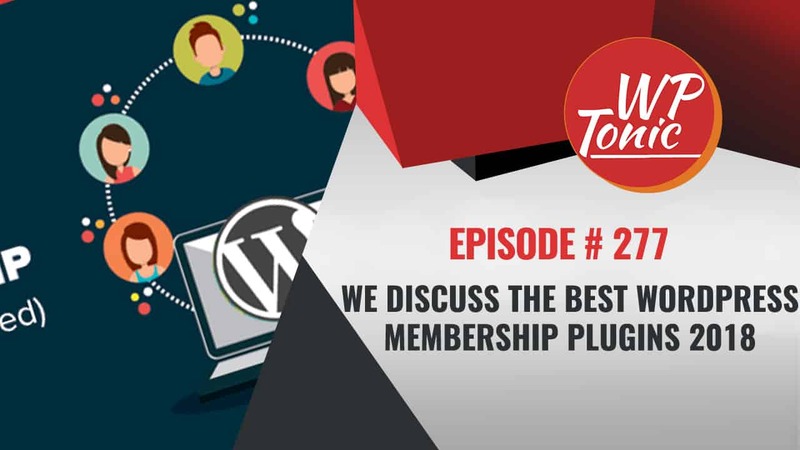 In this episode, Jonathan and I covered a plethora of information on selecting and implementing WordPress membership plugins. Make sure to grab the full episode/blog post so you don’t miss anything. I always push the importance of planning ahead. If you don’t know your requirements, you can’t select the best plugin for the job. Once you understand what you need the plugin to do, then you can select the best one for your needs. For example, do people need to purchase memberships that are not linked to other memberships? Many memberships have a series of levels like Silver, Gold, and Platinum that all build upon each other. If this is your only need for membership levels, then Paid Memberships Pro may be your best option. It’s certainly one of the easiest plugins to install and configure. PMPro is a freemium model, and the free version is quite robust including not only the ability to create memberships and hide private content but add-ons for many email opt-in providers, WooCommerce, bbPress, and BuddyPress. If people do need to purchase memberships that are not related to each other, for example in my Online Course classes people might take a class on LearnDash or on LifterLMS but probably not on both, then my go to is MemberPress. It is more complex to configure, but more robust. As with many software options, once you make a choice, making changes can be difficult. This is why it’s important to do your planning ahead of time. Sometimes there are options for migrating from one platform to another, but not always. I have had to work on the NOT option too many times, and it hurts. For many site creators, recurring income is one of the main reasons they look to create a membership model. One important thing to know about recurring memberships is how payment systems support them. I recommend Stripe or other credit card processor that truly allows your site to manage the memberships. This allows people to upgrade and downgrade memberships within your site. If you are using PayPal for recurring payments, the membership/subscription is actually a PayPal subscription. In this case in order to change, a person has to cancel within PayPal and then signup again with a new membership level. The more difficult it is to make changes to a membership, the more chance you have of losing a customer. One of the best explanations I have heard of this situation came from Steve Burge at WordCamp Miami 2015. This is a man who knows about membership websites in that his company OS Training has hundreds of customers on recurring memberships.